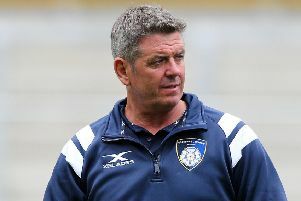 Huddersfield’s slim hopes of pipping Chester to the National Two North play-off spot were dashed as they could manage only a 17-12 win at Wharfedale, missing out on a four-try bonus point. Huddersfield started brightly, winger Elliott Spiers and fly-half Jack Maplesden crossing the line for a 12-0 lead. The hosts hit back with centre Harry Bullough scoring and stand-off Jack Blakeney-Edwards converting, but Huddersfield had the last word of the half with centre Will Milner scoring an unconverted try to lead 17-7. But the second half was a closely-fought affair, the only other score being another try from Bullough on 72 minutes which gave Wharfedale a losing bonus point. Harrogate’s hopes of scraping into the North Premier league play-offs were dashed as they could only beat Sandal 24-13, missing out on a four-try bonus point and seeing rivals Blaydon win 87-15 to secure second spot. Elsewhere, Hull rounded off the title with a 62-0 win over Rossendale, while Ilkley ran in seven tries on their way to a 45-0 win over hosts Kendal. In North One East, Scarborough will go to Blackburn in the play-offs as they aim to take the third promotion spot into the North Premier league while, at the other end of the table, Cleckheaton ensured they finish fourth bottom and survive thanks to a 49-26 win over Malton and Norton.